Don’t Say The “B Word”! I’ve come to the conclusion that saying “blockchain” has become unhelpful. It just confuses people. It means too many different things to different people and so it’s almost impossible to have a conversation in this space without talking past each other. So, as I argued in this piece on permissionless ledgers and this piece on permissioned ledgers, it can be useful to talk in terms of replicated shared ledgers – since I think this gets to the heart of what unifies – and separates – these two worlds. In this piece, I try to bring it all together – to explain why we should be thinking about permissionless ledgers as a classic example of disruptive innovation and how I think banks could think about permissioned ledgers in the interim. A unified model of permissioned and permissionless ledgers? So, it’s not a surprise that we’re seeing innovation and experimentation in the fields of value transfer – such as micro-micro payments (nanopayments?) for video content – and in the recording and execution of agreements. This is, almost but not entirely, exclusively being driven by people from outside the traditional financial sector. They’re taking a platform that is, in most meaningful ways, slower and more expensive than today’s financial system and using it for novel purposes. Notwithstanding the promise – or threat – of permissionless systems, I sense that many financial firms are looking closely at permissioned systems, by which I mean technologies that allow multiple firms to run a private, shared ledger of some sort. What most people fail to ask is: why?! 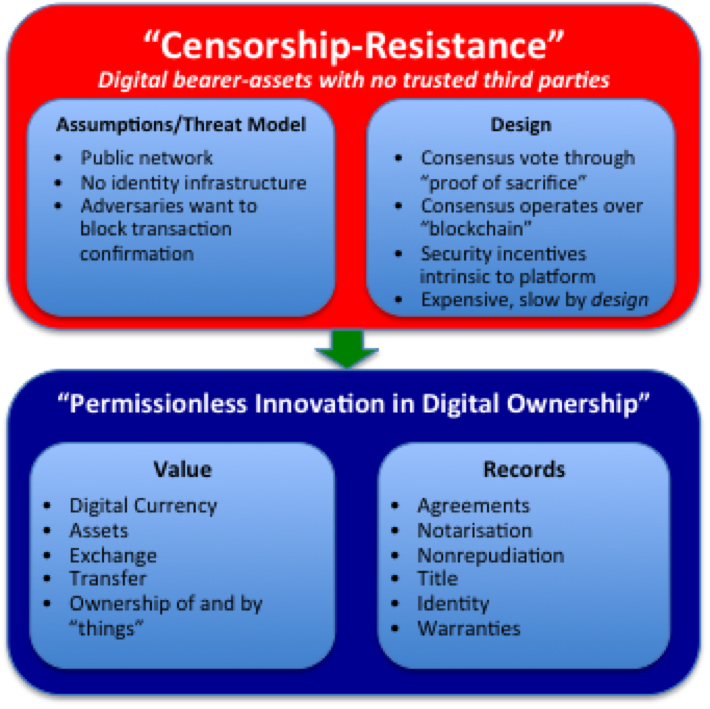 If you don’t have censorship-resistance as your business objective, why are you looking at this space at all? The answer, I argued, in this piece is that replicated, shared ledgers can also solve a different problem: if you’re in an industry where multiple firms all run similar systems to keep track of records (account balances? derivatives positions? orders?) then you’re probably carrying cost you don’t need: everybody is paying to maintain these duplicated, non-differentiating systems. And, because they’re all slightly different, you need to reconcile them with each other all the time to make sure they agree. Is the promise of permissioned ledger the possibility of industry-level systems of record without a powerful central gatekeeper? But we can take this thought-process further. Imagine such a platform existed: perhaps a replicated shared ledger that recorded all inter-bank balances or recorded all derivatives positions between firms. What we would effectively have is a transaction processing system for that industry: if we all agree that this shared ledger is authoritative for records (e.g. who owes what to whom) then could we not also agree that this ledger is something to which we could deploy code that describes our agreements? Could this industry-level ledger also host inter-firm business logic? How much cost and complexity might that remove from firms? 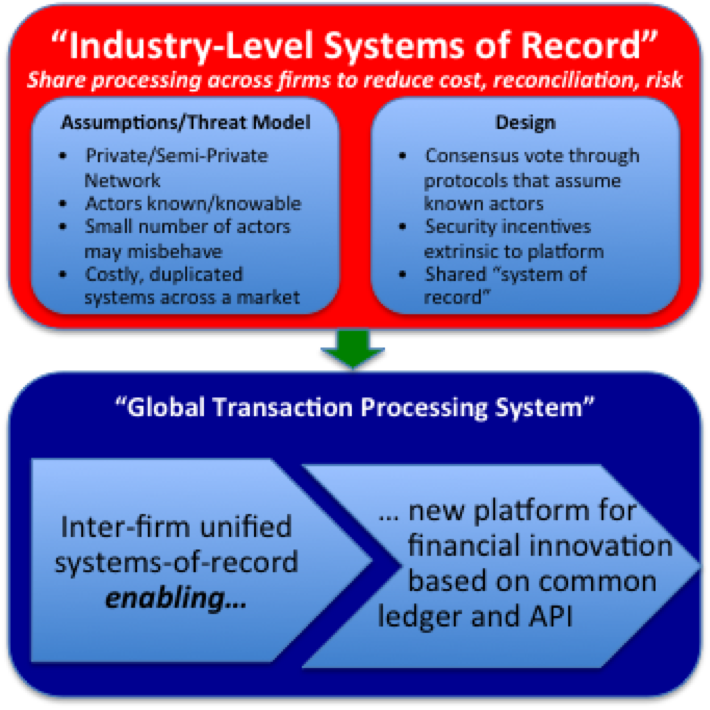 Is a common ledger between firms the enabler for a common transaction processing platform for an industry? In the permissionless world, some of the most interesting developments are happening at the level of transaction scripting and smart contracts. The Ethereum project is the most obvious example, of course, but even projects like Streamium are showing how Bitcoin features can be used to create interaction models that simply aren’t possible on today’s financial platforms. Similarly, and as I argued above, the driver of innovation on permissioned ledgers might be the migration of inter-firm business logic from individual firms to a shared ledger between firms: think of code that represents an agreement between two firms, that executes “on” a ledger, which can take custody of assets on that ledger and execute in response to external events: if both firms have signed it off in advance, suddenly they don’t need all the cost and expense of their own systems. I wrote about this idea in my piece on smart contracts. 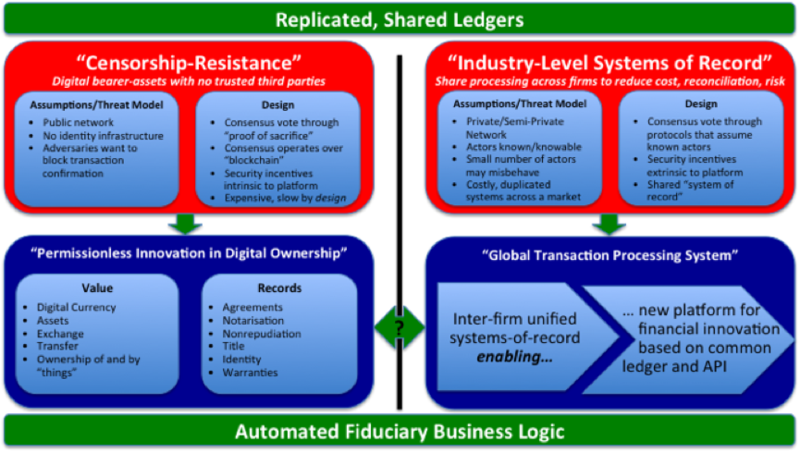 So we see that the two worlds of replicated, shard ledgers – permissioned and permissionless – might actually be leading us to the same place: a world where business logic for money – automated fiduciary code, if you like – is deployed to a shared ledger and run autonomously. Perhaps the permissioned and permissionless worlds aren’t as different as they seem? I heartily approve of your push to refine terminology by replacing the word “blockchain” with something less ambiguous and more informative. Is it too late to, instead of calling them “permissioned” and “permissionless”, call them “controlled-membership” and “open-membership”? Because “permissioned” itself is ambiguous — people might think it means that permission is required to connect as a *client* or to have your specific transactions *included*, but I don’t think it implies that at all — we’re talking solely about the set of *servers* or validators, and they may be unable to apply constraints to the set of clients or to the set of transactions. We should talk more about how these two worlds come together for me. I think you dropped the clue there with the economist peice about unserved market segments… But that peice needs expanding. I think that it really depends upon what you are trying to achieve. In some instances there will be a need to have both approaches and it really is like a maths problem… sometimes it is equally important to show your working and other times you simply want the answer shared, One of the great assumptions here is that privacy is binary… it really is more a case of working through where the benefit comes for all parties and sharing the least amount of data to achieve this business goal. The great benefit of shared distributed ledgers is their immutability however, just because something is immutable does not mean it is accurate. The consensus element and ability to challenge is equally an important aspect of using distributed ledgers. I see this as a great leveller in industries where the barrier to entry is currently high because of the need to ensure continuity of service. If a small start-up/entrant uses this technology then the impact of any failure is minimised for the end users as the data is readily available to continue services should a business failure occur. It can solve the “too small enough to be trusted” problem. @zooko – very good point…. it conflates (at least) two concepts, doesn’t it… i.e. “who is allowed to transact/connect/participate” and “who gets to say which transactions are committed”. @stephen – thanks… very helpful. I tend not to talk about the immutability (since I’m not sure it’s a safe thing to assume of permissioned ledgers — and Robert Sams/Tim Swanson would argue it’s not a safe thing to assume of *permissionless* ledgers! )… but the availability angle is great… this comes straight from the ability for nodes to bootstrap themselves and/or catchup from peers, right? Great post as always. But there’s also a practical, if ultimately temporary, distinction between permissionless and permissioned ledgers – governance, scalability and transaction costs. The bitcoin block size debate (and risk of a fork) suggests that permissionless ledgers are not yet ready for real commercial use, because no company can know or control what their capacity or transaction costs will look like in 5 years. But 20 years from now, bitcoin (or another permissionless ledger) might be sufficiently mature and high-capacity to let institutions feel confident about their transactions over it, perhaps with some thin encryption layer and/or address whitelist to isolate their transactions from the wider world. A useful analogy is how many companies responded to the Internet by first building Intranets but eventually moving to VPNs. More from Richard Gendal Brown on replicated shared ledgers. Very practical approach Gendal.i am learning finance slowly with an angle I would like to present on my blog.